Ideal for businesses that need an efficient way to track cross-team collaboration on projects and tasks. Asana is a cloud-based project management software system that helps companies assign, prioritize, and manage tasks across teams. Used by organizations like Pinterest, NASA, Spotify, and Airbnb, Asana offers a wide range of customizable options and features—more functionality than most teams will need—but enables users to pick and choose which features they prefer to utilize in order to increase productivity and create the most effective workflow for their needs. Starts at $9.99/user/month (billed annually) or $11.99/user/month (billed monthly) for Premium. Premium features available at lower cost for smaller teams (<15 members). Is Asana the right software for you? Asana is a cloud-based project management system that enables teams to organize, assign, and prioritize tasks within their organization. Used by organizations like Pinterest and NASA, Asana provides a robust set of features that may present a higher learning curve than more straightforward options like Trello. However, after the initial onboarding process, users will be able to create and track workflows in an incredibly detailed manner, ensuring that they can stay on top of deadlines and distribute tasks equally across team members. Asana provides users with visualizations that help them track progress, create and assign tasks to the correct individuals, and indicate dependencies between tasks. And, since Asana provides the option to choose between the two main project workflow options (a list or a Kanban board), it also provides more customizable options than its competitors. Whereas many of Asana's competitors have dated UI's, Asana has a modern look and feel, with an attractive UI that makes the system enjoyable to use. Asana's free plan supports up to 15 users, and unlimited tasks, projects, and conversations, making it a suitable starting point for small businesses that like the flexibility of being able to choose which projects should be organized in lists vs. Kanban-style boards. Below, we'll discuss the key features of Asana, and how they can benefit your business. In Asana, projects can be broken up into sections, as well as tasks within each section. Furthermore, you can split up each task into various subtasks. You can label each component and assign a specific due date, as well as assign an owner of each task. 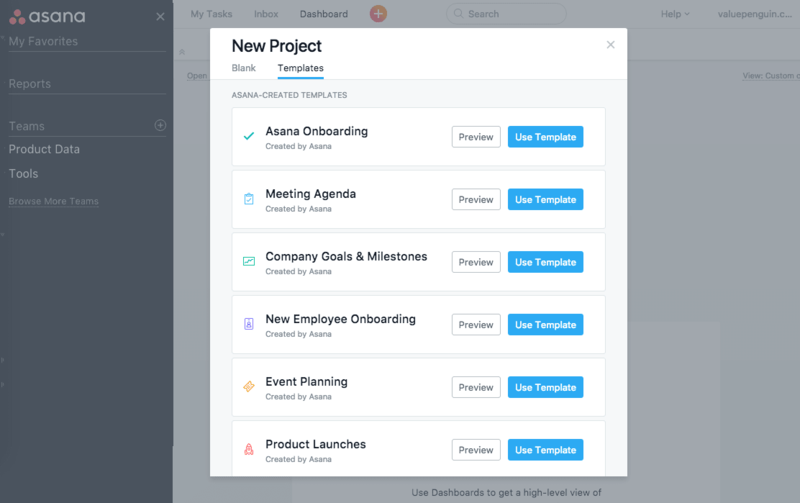 Asana enables users to create new projects in two ways: as a Kanban-style board, or a list. By providing the option to choose between these two workflow visualization styles, Asana enables teams to support each team member's preference in one universal product. However, note that if you've started a project as a board, but would like to convert it into a list (or vice versa), Asana does not currently offer the functionality to do that. Although this feature may become available in the future, for the time being, when starting a new project, you'll have to make sure that you spend some time thinking if the particular project you're starting would be organized best in a list or a Kanban-style board. You can think of Asana lists as to-do lists, except with much more functionality. You can organize lists into different sections, create various tasks within each section, and assign them to different team members. You can also categorize and color code your tasks by adding relevant tag names. Asana also brings in a social-media-like functionality in the form of a "like" button that enables other team members to react to certain activities or tasks. On the left, you can see that tasks in our example project are divided into a "basics" section and an "advanced features" section. You can also see a log of recent activity in the panel, which shows files that were recently attached to this project. The tabs in the main menu along the top show five ways to view your list project: as a list, as conversations between team members, as a calendar, as a graph of progress (tasks completed vs. tasks remaining), and in terms of all the files associated with this particular project. Asana does not place any limit on the amount of files you can upload; however, it does set a limit of 100MB per file. Any files larger than that will need to be attached through integrations with cloud-based file storage solutions like Google Drive or Dropbox. The kanban-style board is similar to Trello, enabling you to organize your project into columns that indicate various stages of progress. Each card corresponds to a task that needs to be completed, but you can also add subtasks within the card, and assign them to different people. This is similar to a checklist functionality in a Trello card, except that Asana provides the additional functionality of being able to assign these subtasks to specific users. Note that you'll need to click into a particular subtask to see any related comments or activity within that subtask; the main card/task won't show all of the activity related to that task/card. For example, in the screenshot above, you can see that a subtask was marked as completed, but it does not show up in the activity log, so we don't know who marked the subtask as completed until we click into the subtask's comments. Regardless if you're using a board or a list to organize your project, you can drag and drop specific tasks to reorder them. However, some of the user design features can be a bit difficult to grasp. For example, pressing Enter after creating a task creates a new blank task, instead of saving or exiting the current task, as expected. You'll have to then click on the new blank task and delete it manually in order to prevent it from showing up as a blank task on your project. You can also get started quickly by using one of Asana's templates and customizing them to fit your own needs. 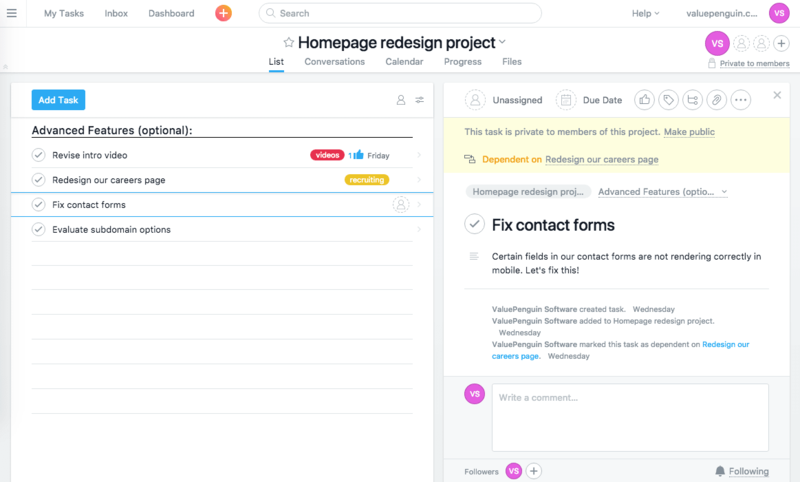 Asana supports the ability to create your own templates, so if you've neatly organized and broken down a certain project into suitable tasks, you can replicate that exact workflow again when a similar project arises in the future. Once you've created a certain number of projects, and have been assigned a number of tasks, it can become difficult to prioritize the ones that matter most to you. For this reason, Asana has also developed a dashboard functionality that each individual user can customize with the projects/tasks that matter most at any given time. You can also sort all components of a dashboard by due date, alphabetically, or by status color. Dashboards provide a nice high-level overview of all projects you're interested in, and enable you to sort and filter by the projects and tasks that matter most at any given time. Asana also offers another nice feature to help you prioritize tasks: subtasks. You can add subtasks within any task to break down any given unit of work into small units that are easier to tackle and divvy out to different team members. Assigning subtasks to different members of your team also makes it very clear who is responsible for which portion of a project. Above, we can see that our intro video tasks is divided into two subtasks, each of which is assigned to a different team member. This makes it immediately apparent who is responsible for any given task or subtask in a project. Asana also understands that complex projects are made up of many moving parts with various dependencies. Not all of the parts can progress independently—sometimes, they require other tasks to be completed before they can move forward. Asana makes it easy to mark which tasks are dependent on other tasks, so you can understand why a particular task may not be moving forward, and prioritize the tasks that could help unblock other tasks. In the image above, we've indicated that the "Fix contact forms" task is dependent on "Redesign our careers page", because it doesn't make sense to fix the contact form until we've finished redesigning all the elements of that particular page. Asana has developed many integrations with widely used communication, cloud-based file storage, and time-tracking tools, including G Suite by Google and Dropbox. Many users find it useful to link Asana tasks with their calendar of choice, whether it's Google Calendar, Outlook Calendar, or iCal. 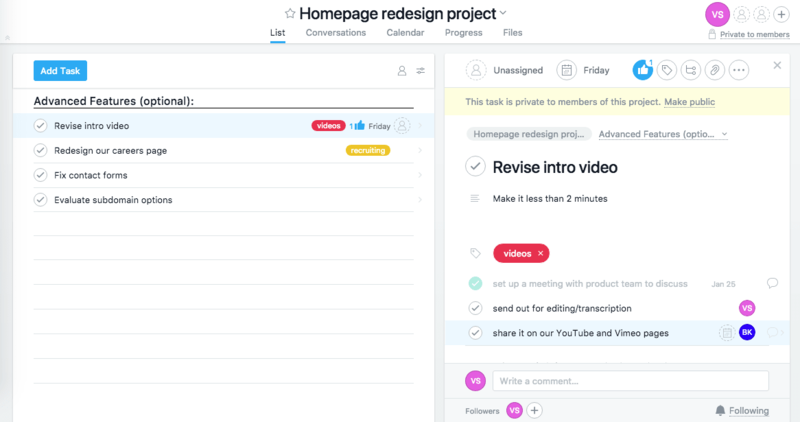 Asana even integrates with other project management tools like Trello and Jira, so your team can easily communicate and make progress on tasks, even if you're tracking them in more than one place. This is particularly useful for large organizations that may have different teams that prefer to use different tools to track the projects and issues, but occasionally all need to work on the same project when it comes to certain cross-team initiatives. Asana also offers an application programming interface for technically minded teams to develop their own custom integrations that bridge Asana with whatever tools they're using across their organization. Asana has gained a strong following among companies for its extensive, customizable task management capabilities. Its main selling point is how customizable it is for various teams and workflow styles. 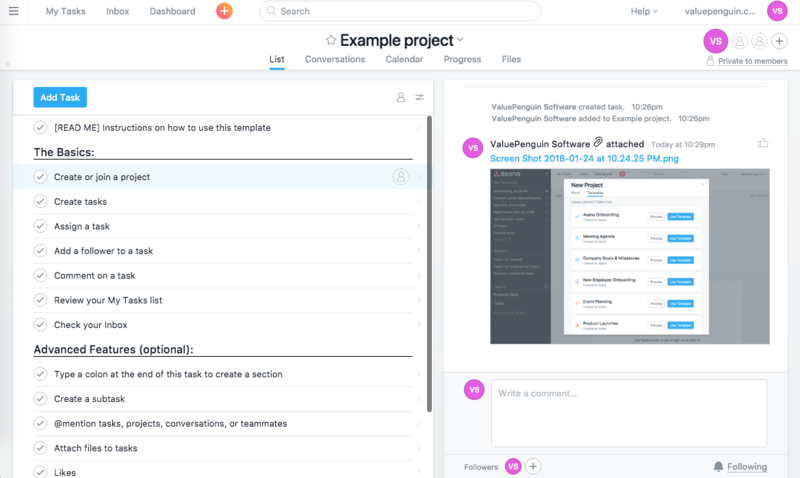 Because it enables users to choose between lists and boards, and integrates with other project management solutions like Trello and Jira, Asana supports a diverse range of teams' workflows and needs. Asana also offers a rich set of features that are designed to help you prioritize tasks, using subtasks and dependencies. It also provides a nice way to visualize progress across all your projects and tasks, and create custom dashboards that help you gain a high-level overview of the information that's most important to you. However, because of its robust set of features, Asana can be more difficult to learn, as opposed to more specialized, straightforward solutions like Trello. Another downside of using Asana is that the user interface can be a bit difficult to master. For example, pressing the Enter key will create a new task within a list, instead of finalizing the current task. We spent a good amount of time accidentally creating tasks and then deleting them manually. However, your experience may vary, so we recommend trying out Asana to see if the user interface suits your preferences. If your organization is larger, but you don't want to pay for project management software, Trello should be able to suit your needs, since its free tier supports unlimited members—particularly if your team prefers to organize tasks into a kanban-style workflow. Asana is the better option for teams that like to organize their work into to-do lists and break them down into small, digestible tasks that can be assigned to multiple people. 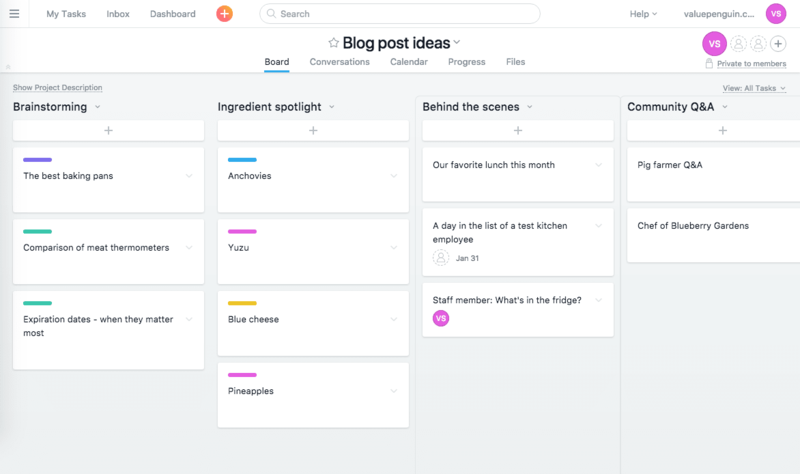 Unlike Trello, where you need to create a board per project in order to really track it and assign small tasks to different individuals, Asana provides more customizable options when it comes to organizing large, complex projects into smaller units of work.